Gamers tend to have a love-hate relationship with that pesky outside world: "reality." We reap benefits like jobs (where we earn money to buy videogames), utilities (where we get electricity to run our videogames), and roads (on which the pizza delivery guy drives, so we don't have to get up from our .... well, you get the picture). But now and then the outside world takes notice of our hobby and its proclivity toward guns, explosions and death as the means of determining victory, and it makes them nervous. When a particularly violent or risquÃ© game comes out, the public reaction is clichÃ©. People see the word "game" and think "toy," which makes them "think of the children." These aggrieved parents contact the government, calling for regulation, bans and fines against any game they feel is too violent or explicit for their young ones. Gamers respond by going on the internet and shouting about free speech and art, decrying the "tyranny of the majority." In short, both sides overreact. Even when we try to sit down and talk to each other instead of about each other, no progress seems to be made. Perhaps that's because the debate is poorly framed. The real problem is that not all games are toys - though they can be. Nor are all games art - though they can be that, as well. But all games are a medium. Virtual Jihadi presents an excellent opportunity for all sides to examine the new distinction of videogames as a medium. In this case, the devil's in the details: Virtual Jihadi is Bilal's hack of an Al-Qaeda skin of the American-made shooter Quest for Saddam. Quest for Saddam gives players the opportunity to shoot up a bunch of Saddam body doubles until reaching the real deal and killing him in the name of truth, justice and apple pie. 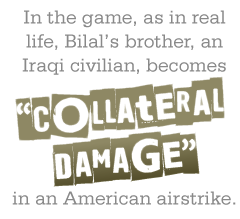 The Al-Qaeda version, The Night of Bush Capturing, not to be confused with Bilal's own game, gives you the exact same gameplay but replaces Saddam with Bush look-alikes for targets. If the concept of the game makes you uncomfortable, don't worry - it should. In his statement about the piece, Bilal writes: "Because we inhabit a comfort zone far from the trauma of [the] conflict zone, we Americans have become desensitized to the violence of war." Iraqis have no comfort zone where they can be away from the violence. Virtual Jihadi turns the tables and makes Americans into the vulnerable ones. And since videogames are an interactive medium, the game is even more disquieting than simply watching American soldiers fall; instead, you're the one gunning them down.